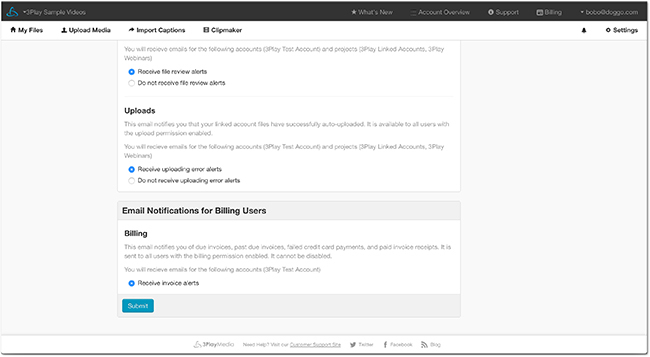 Email notifications are set according to which projects your user has upload / billing access to. 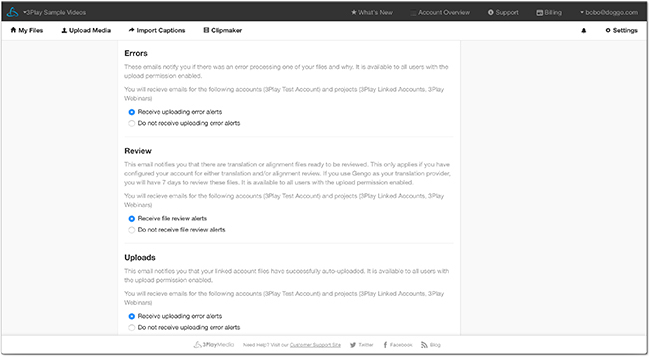 These settings (once set), will apply to every project you have upload / billing access to. If you do not have upload / billing access to a project, these settings will not display for you. Follow the steps below to turn e-mail alerts on or off. Click the email address of the signed in user located at the top, right-hand corner of the page. Click Email Notifications located on the left-hand side of the screen. Set the frequency that email notifications will be sent to the user. This setting will notify the user that following services are complete; transcription/captioning, alignment, translation, and caption encoding requests. This setting is available to users with upload permissions enabled. Emails will only trigger if there are completed requests so if nothing has been completed within the selected time period an email will not be sent out. To opt out of these emails select, I do NOT want to be notified of completed work. Next in the Completed Files section select "I want to be notified of completed work" to receive an email notification immediately upon completion for expedited,rush, same day, or 2-hour turnaround transcription/captioning requests please select Receive rush service alerts. This email notifies you of any work that is completed, rejected, or encounters any other status event requiring your attention. 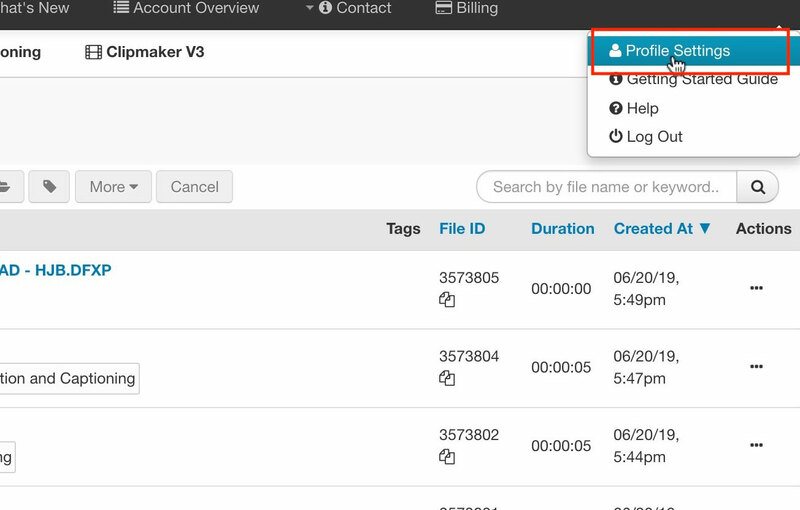 Users can select the option to only be notified of work related to files that they have personally uploaded. 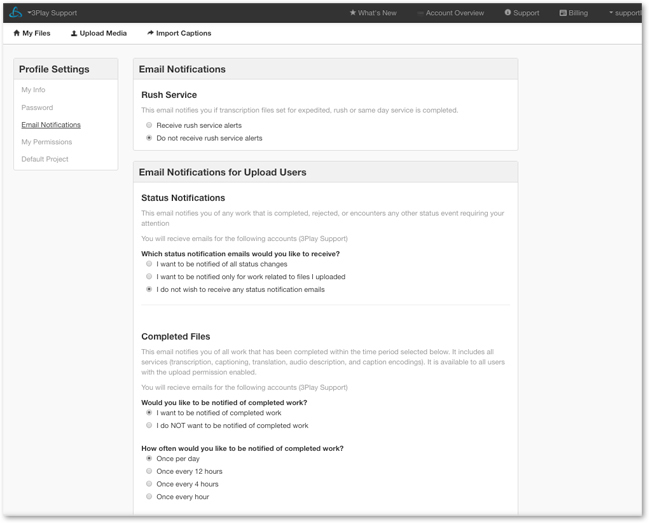 The status notification options include: I want to be notified of all status changes, I want to be notified only for work related to files I uploaded, and I do not wish to receive any status notification emails. These emails notify you if there was an error processing one of your files and why. It is available to all users with the upload permission enabled. This email notifies you of due invoices, failed credit card payments, and paid invoice receipts. It is sent to all users with the billing permission enabled. Click Save Changes to save your preference.